The fire of a Tiger man is intense and passionate, but short lived. Male Tigers will charge into a relationship ready for anything, but will abandon it as soon as it turns dull or boring. The Tiger man believes in love at first sight and once he finds a woman he may fall in love immediately and completely. Due to their strong personality, it may be hard for the object of their affection to resist this impulse. 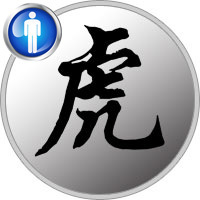 The Tiger sign is the most masculine of the entire Chinese Zodiac and thus manhood is very important to them. Any insult to their strength or virility can invoke instant rage and fight. Unlike what many may think, the Tiger man is actually a peaceful sign, and provoking the male Tiger usually requires a good deal of effort. Natural born leaders, Tigers will be quick to take charge of a situation or project and lead it to its eventual perfect completion. The Tiger man is strong willed and he relies on his own judgment and impulses to move forward in life. He will set a target and propel toward it with unflinching determination. Few people are likely to have as much willpower, courage and optimism as the Tiger male. Once he has set up an objective, nobody can deter him from his chosen course of action and no force can diminish his dogged determination to go forward. In no way does he retreat; in no way does he indulge in negative thinking. Aided by his power of quick decision, he only trusts his own judgement, refusing to be advised or directed in any way. He must reach his target, come what may, or he will die for it is impossible for him to accept failure, to grant himself a loophole or fallback. Spontaneous, whole-souled, thirsty for the absolute, this character vigorously rejects mediocrity under all form and half-measures of all description. He likes to wrestle. He loves difficulties. Whatever the odds, his powerful dynamism makes him an overwhelming zealot as well as an aggressive pioneer in all fields of endeavor. But despite his motivation and enthusiasm, success is not always his due as he is somewhat narrow-minded and totally ignorant of his limitations. He never wants to acknowledge that no one could triumph on all fronts all the time with only blind faith and raw courage. He needs a grand and noble ideal to fight for – an ideal that would permit him to have his name written in the book of History, so to speak – since it would be difficult for him to function properly without a target in life. Although his lofty dedication may bring him honors and celebrity, these are the very last things he is concerned about; only victory interests him. His favorite battlefields are politics, trade unions, and the cause of widows and orphans. Because of his nonconformism and iconoclasm, he is always at odds with the established order or higher authority. A champion of change and innovations, he uses all his forces to carry out a revolution in every possible field. His motivation is so forceful and his devotement so contagious that he can convert quite a number of indifferent people to his crusades. This man is an adventurer in every good sense of the word. Contemptuous of those who play it safe, he likes gambling with his life, rushing headlong into every conceivable undertaking, oblivious of dangers and flirting with death. He detests beaten tracks, abhors routine, and never does a thing in the same manner the second time. Should he fail in any of his enterprises, he would immediately stand up and make a fresh start with unshaken faith. He believes existence is a tremendous challenge, a fascinating venture, and means to live it to the full, even if he has to burn the candle at both ends. His zest for living is unequaled. His destiny is generally exceptional, stormy, full of upsets and reversals, and sometimes ends with sudden and violent death. Although high-strung and provocatively obstinate, the Tiger man is likeable in many ways. His best qualities are undoubtedly his absolute sincerity and honesty. He is incapable of double talk, mental reservation, cheating, injustice or the like. These very qualities, however, are his Achilles’ heel since they render him naive, unsuspecting and therefore vulnerable – it is indeed quite easy to deceive him, dupe him, betray him. He is defenseless before other people’s bad faith. But when he realizes having been fooled, he may react violently, dangerously, devastatingly, going as far as to commit criminal acts. One would be well inspired never to trifle with his confidence. Despite his boundless ambition, he commands the respect of all who know him well, even though they happen to be his bitterest adversaries. There is not a single streak of egoism or meanness in his nature. His generosity and chivalrousness are unparalleled. He is capable of great sympathy for and devotion to those whom he loves. His friends are all to him, and he is always willing to go to any length on their behalf. One can count on his loyalty under any and all circumstances.